I am a veterinarian, bioethicist, and philosopher. Currently, my various professional backgrounds merge in the field of animal welfare. 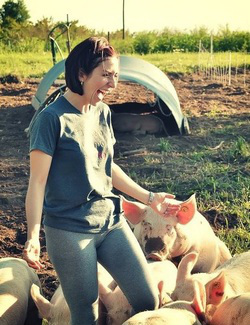 I work as an animal welfare specialist for Compassion in World Farming (CIWF) US, a UK-based non-profit organization that focuses on improving welfare for farm animals. At CIWF, I am part of the Food Business team, and my work involves assuring that our strategy is grounded in robust science. My previous work and research areas include clinical wildlife medicine, wildlife rehabilitation and reintroduction, and animal welfare. I am also a doctoral candidate in the Department of Philosophy at Michigan State University (MSU), under the direction of Dr. Paul B. Thompson, W.K. Kellogg Chair in Agricultural, Food, and Community Ethics. I am pursuing two graduate specializations: Animal Studies, and Ecological Food and Farming Systems. My dissertation project focuses on the use of evidence in animal welfare science, policy, and practices. My work in philosophy stems from my experience as a veterinarian, but is also informed by interests and knowledge I've picked up along the way such as feminist philosophy of science, intersectionality theory, philosophy of food and agriculture, bioethics, and animal welfare. I especially enjoy working on these topics in the context of cross-disciplinary projects.